ENERGY STAR® certified bulbs can replace standard incandescent bulbs in almost any fixture. 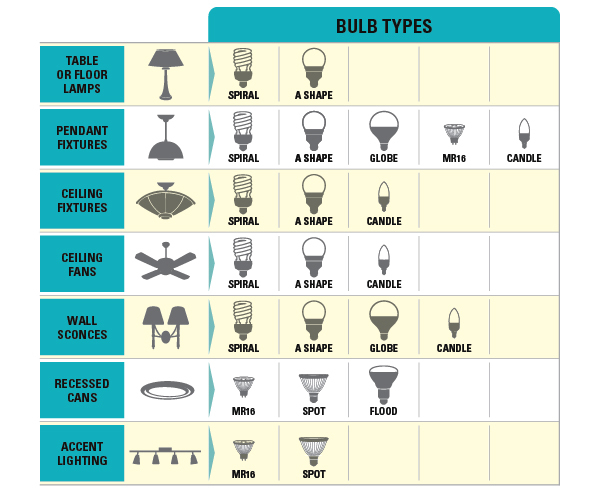 Maximize performance and bulb life by referring to bulb type recommendations for various fixtures in the chart below. Consult the bulb packaging to ensure the light you choose is designed for your intended use. Visit energystar.gov/products/choose_a_light to find the right bulb for your needs. Look for lumens. Lumens are a measure of brightness. The higher the lumens, the brighter the bulb. Watts are a measure of energy use. A 60-watt incandescent bulb and a 10-watt LED may have the same lumen output and brightness, but the lower wattage LED uses less energy. The table below shows the lumen output needed to match the brightness of your old incandescent bulb. Refer to the Lighting Facts Label. 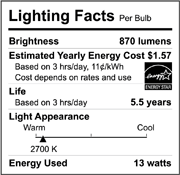 All light bulbs have a Lighting Facts label on the package. This label will help you compare bulbs so you can buy the best one for your needs. To compare the efficiency of bulbs, look at the total lumens per watt. A 13-watt bulb with a brightness of 800 lumens puts out more light for the same energy as a 13-watt bulb with a brightness of 750 lumens. The highest-use fixtures in a home are typically kitchen ceiling lights, living or family room lamps and outdoor porch lights or post lamps. 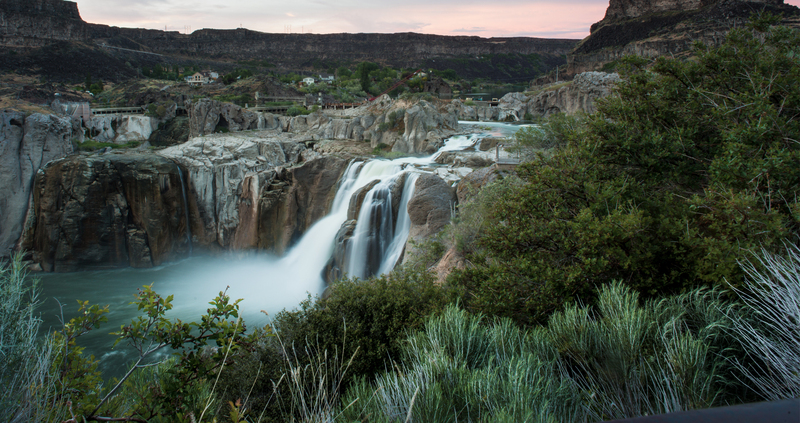 Since these lights are on the most, you’ll save more energy by replacing these first. Use ENERGY STAR certified bulbs in hard-to-reach fixtures. Ceiling fans, ceiling lights and enclosed outdoor lights can be difficult to reach or access. Because ENERGY STAR bulbs last longer, you’ll enjoy the convenience of buying and changing bulbs less frequently. Pick a bulb that offers a shade of white light that works best for you. ENERGY STAR certified bulbs come in a variety of color choices, such as soft white, bright white and daylight. Try softer, warm colors for general illumination and use cool, bright colors for task lighting, such as reading lamps. Choose the right shape bulb for each fixture. ENERGY STAR certified bulbs are available in different sizes and shapes to fit almost any fixture. For example, for recessed can lights, choose a reflector bulb designed to distribute light downward. Make sure the bulb is rated for the application. Check to see if the bulb is rated for outdoor use; dimmers; enclosed fixtures or other special applications, such as timers or motion sensors. Not all bulbs are compatible with these applications. Place ENERGY STAR® certified bulbs in the fixtures you use most. Turn off lights when you leave the room, and don’t use more light than you need. Install timers on outdoor lights to turn them off during the day. Note: Some bulbs are not intended for use with digital timers, choose a mechanical one. Be strategic. Put a lamp in the corner of the room where it can reflect light off two wall surfaces instead of one. Take advantage of natural daylight. Use reflective blinds to allow light into a room while protecting your privacy. Decorate with bright colors to reflect daylight. Use task lighting. Instead of brightly illuminating entire rooms, focus the light where you need it, on a desk, at the kitchen sink or over your workbench. Dust light fixtures regularly to prevent dirt build-up. Dirt reduces a bulb’s light output.